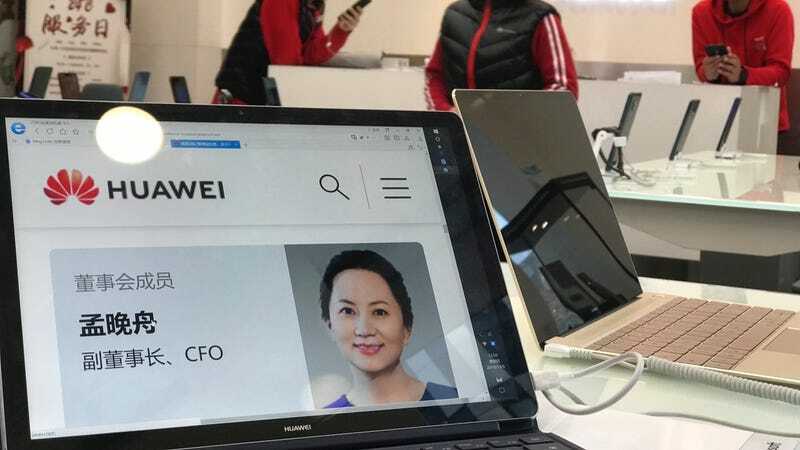 A profile of Huawei’s chief financial officer Meng Wanzhou is displayed on a Huawei computer at a Huawei store in Beijing, China, Thursday, Dec. 6, 2018. Today the Chinese government called for the release of Meng Wanzhou, an executive at Chinese electronics maker Huawei after she was arrested in Canada last weekend while transferring flights. Meng reportedly faces extradition to the U.S. for allegedly violating American sanctions against Iran. China’s embassy in Canada has said it “opposes and strongly protests over such kind of actions which seriously harmed the human rights of the victim,” which will raise more than a few eyebrows, given China’s horrendous track record with human rights. It’s believed anywhere from 800,000 to 2 million Muslims have been detained without charge in China’s concentration camps since April 2017, among other humanitarian concerns. Meng was arrested in Vancouver on December 1, the same day that President Donald Trump was in a high-stakes meeting with China’s president, Xi Jinping. Trump and Xi have been battling over tariffs, something that has set the U.S. financial markets into a tailspin this week, causing the Dow to drop nearly 800 points on Tuesday. Meng has a bail hearing set for Friday, according to Canada’s Globe and Mail. Huawei is one of the largest tech companies in the world, but it has been under pressure in nations like the U.S., U.K., and Australia for allegedly doing the bidding of the Chinese government. Huawei has been banned from helping build fundamental communications infrastructure in some western countries, including 5G telecom service, over fears that it leaves those countries vulnerable to espionage on behalf of the Chinese government. Best Buy has even halted sales of Huawei devices completely in the U.S. Growing tensions between the U.S. and China, Russia, and North Korea have caused global concern. And this latest shot across the bow by the Trump regime is unlikely to calm anything down. Nobody knows how China will retaliate if Meng is ultimately extradited to New York to face charges. But the tumultuous relationship between the two countries appears to be the new normal. When the New York Times reported that China spies on President Trump’s unsecured phone, China trolled the U.S. and suggested that he use Huawei technology instead. That couldn’t have gone over well for people like Trump’s super-hawk national security adviser John Bolton, who’s not so coincidentally been itching for a war with Iran forever. Strap in. It only gets weirder and more dangerous from here.